Here's part of the group at the weather station. About 30 people attended the workshop. 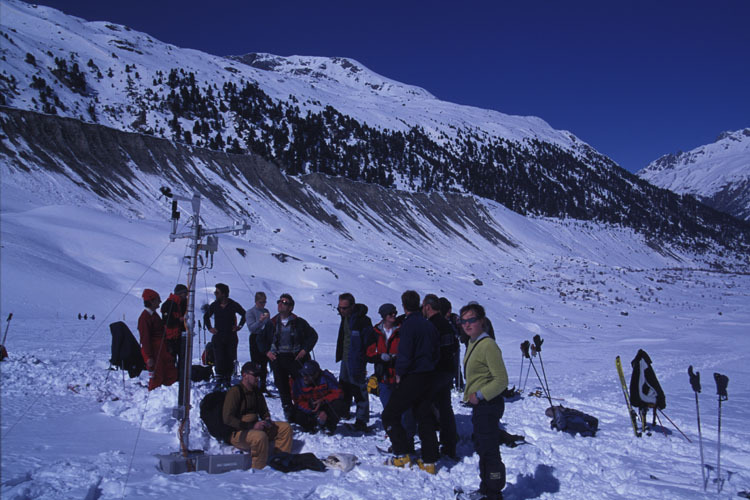 At the end of the workshop someone got up and asked who isn't here who runs weather stations on glaciers? The only answer we could come up with was the U Wisconsin group (that runs a lot of stations in Antarctica, including our iceberg stations) and the Russians (who didn't have the funds to attend). So it is a pretty small community. There is a very nice lateral moraine along the side of the glacier (there are trees above it but there are none below it). I don't remember the exact date of this moraine, but it was sometime in the 1800's or early 1900's. As you can tell, the glacier has receded significantly since that time.